Each year the River Recreation Festival brings in the fried foods and other delicious items, a staple for the Fourth of July Celebration along with its yearly fireworks. GALLIPOLIS — The Gallia County Chamber of Commerce has set the schedule for entertainment and activities for the upcoming River Recreation Festival. Opening ceremony will start at 9:30 a.m. on Tuesday July 3, followed by concessions and inflatables at 10 a.m. Gospel music artists will be on stage from 10 a.m. until 2 p.m.. Each group will have 30 minutes on stage Starting with Covered by Love, the Singing Shafers, Southern Harmony, Victory river Quartet, the Neal Family, and finally the Raineys from 12:30-2 p.m. The Artisan Shoppe will hold studio classes from 10 a.m. to 7 p.m. The Little Miss and Mister Firecracker Contest will kick off at 2 p.m. after the Gospel Music session. The KidZone opens from 3 to 5 p.m. with 3 to 4 p.m. holding a foam party and 4to 5 p.m. hosting hula hoops, jump rope and water balloons. At 4 p.m. a talent show will start, and is being sponsored by the Gallipolis Junior Women’s Club in the amphitheater. From 6-10 p.m. there will be Contemporary Christian Music artists performing on stage, although final details have not been set at time of print. Mountain Monsters’ television show tracker Wild Bill will be present to give autographs both days of the festival. On Wednesday, July 4, the Baby Tot Sparkler Contest will kick of the day at 9 a.m. with registration opening at 7:45. Concessions and inflatables will open at 10 a.m. The Artisan Shoppe will again hold classes from 10 a.m. to 7 p.m.
KidZone will open at 11 a.m with terrapin races, frog jumping and sack races. From 1 to 3 p.m. will be Nerf Wars. From noon until 3 p.m. there will be country artists on stage featuring James Depre, Bucky Covington, and Branch and Dean. The Rotary Mile, an annual tradition at River Rec, will start at 3:30 p.m. immediately followed by the Fourth of July Parade at 4 p.m.
Evening entertainment will begin at 6:30 p.m. in the amphitheater with Nick Clagg and Briar Williams. They will be followed by Dillon Wade Jarrell at 8 p.m. and Devin Henry at 9 p.m. All of the entertainers Wednesday evening are local artists. The fireworks will start at 10 p.m. with local artist Paul “Bub” Williams performing immediately following. 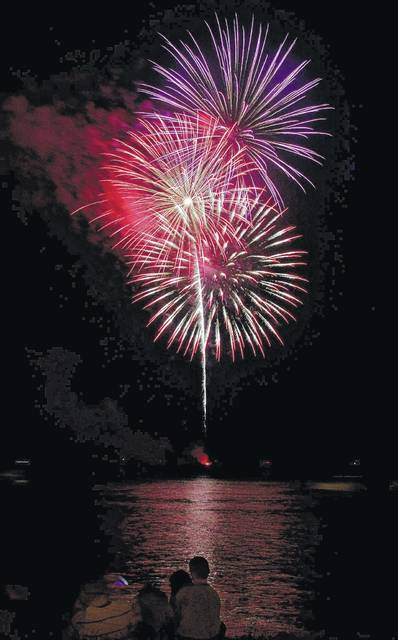 https://www.mydailytribune.com/wp-content/uploads/sites/42/2018/07/web1_riverrec-fireworks.jpgEach year the River Recreation Festival brings in the fried foods and other delicious items, a staple for the Fourth of July Celebration along with its yearly fireworks.